Aaron, I just wanted to take a moment to thank you for the knowledge, fun and wisdom you gave to Joshua this past year. Please know that him deciding to stop taking lessons had absolutely nothing to do with you at all. You are an awesome drum teacher and Joshua thought you were very cool as well. Hopefully he will revisit this in the future. I know that he LOVES listening to music and dissecting it with both me and his Mom. Some of my musician friends as well as yourself tell me that they were on and off with lessons as a small child. They obviously didn’t gravitate to it immediately because of their age BUT then something just clicked and they started to focus and explore it correctly. I’m hoping that happens with Joshua in the future. I just wanted to let you guys know what a great time we had at the Breakaway last Sunday and how fantastic all the bands were. You and your husband really do an amazing job with these kids. I was so impressed with Isabel and what she has learned in such a short period of time. Just wanted to say thanks for creating such a wonderful space for our kids to be a part of music in their own ways! Our communities would not be the same without you and your staff. Extremely pleased with instruction from IAN – I am rapidly learning new skills and theory from an enjoyable musical perspective rather than just mechanics. Perfect Choice for Music Lessons. My daughter could not be happier with her experience at DeAngelis. The staff is wonderful. Amazing teachers, professional studio, and very easy to work with. I learned so much about collaborating with other talented youth, and what being a rock star is like. Thank you so much! I love this place it is the best music studio ever. I used to be just a small singer now I am an amazing singer and new guitarist! Also I am in a band with great people who are now some of my best friends. I am grateful to be part of this school. Great place to learn from a friendly staff. Came in as a beginner and was jamming in only a few months!! All instructors are on point. Wonderful teachers and fun atmosphere – my daughter loved it here and we plan on going back in the future! Wow!! Great place great teachers, I highly recommend DeAngelis Studio of Music to anyone with kids that are musical. The staff there knows how to get the most out of every kid! Good music school…fun place to learn. After the first few lessons I was very pleased with Abbott and I look fwd to the rest of the lessons. I will likely continue with lessons after the Groupon sessions end. Thank you. Well, being in a band that is part of the DeAngelis Rock School, I have to say from a first hand experience, that this is the best way to start off in the music industry. I love the program and Mike isn’t so bad himself! Hahaha! I can’t say enough good things about Mike and the DeAngelis school of music and arts. My son is so happy with his guitar lessons and his band. He’s not an easy kid to keep interested in anything and Mike and his teachers have the patience to keep him focused and engaged. My son and I could not be happier. His playing is coming along nicely and his band flat out rocks! Thanks DeAngelis school. I am so impressed with Deangelis Studio. My son is in a band with the Rock School and he absolutely loves it. They have these great shows at great places.,,Hard Rock Café in Boston just to name one. If you have a child that has an interest in music you should definitely look into Deangelis. 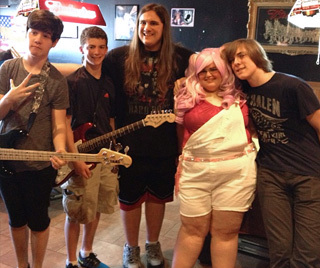 Not only do they get these kids to sound like superstars they really make them fell like one too….Awesome! We have been so pleased with DeAngleis Studio of Music. When my son first started with Jammers playing drums he barely practiced. Now we can’t get him to stop! He looks forward to going every week. Mike and Nancy are so nice and welcoming to everyone that walks into their business. I am so glad we made the one phone call to find out more information on the school. The kids finally have a place to shine and do what they love doing. We found DeAngelis Studio online and were immediately impressed when we first visited. Our son, who was only six at the time,was very nervous starting lessons. Mike was extremely welcoming and warm. Mike’s approach and style erased any jitters my son had.This was almost 2 years ago. My son, who didn’t know one chord when he started, knows approximately 20 songs now and loves Mike’s teaching style. Mike has a very relaxed atmosphere and stresses that his lessons are about kids enjoying the music and enjoying the learning experience. Mike really encourages kids to take on a style of their own and really helps them to grow and experience music on many levels. I have recommended Mike and his team to many of our friends and will continue to do so. The happiness he has brought my son is priceless. DeAngelis Studio of Music is the best for music lessons. We have tried other places in Haverhill and they did not even come close. My kids take guitar lessons with Mike A. and drum lessons with Craig, and they absolutely LOVE IT. The Rock School/Ensembles are a great experience for my kids. They have a fun time with Mike DeAngelis leading the way. The Location is so convenient that my kids walk there after school and it also saves on gas. I love it at DeAngelis Studio. I brought my 10 year old son for lessons after he received a guitar for Christmas. He never played before, and now he’s enjoying it and doing great. Mike is a great teacher and my son is very comfortable and has a good time. The atmosphere at the studio is so cool, and there’s a place for me to sit and read magazines while my son is having his lesson. DeAngelis has also put together a few rock bands consisting of their students, and I think that’s such an incredible opportunity for young musicians!! I wish there was something like this when I was younger Also, the studio is located in a great downtown location, so convenient. I highly recommend DeAngelis Studio!! What a great place for kids to go! The facility is very impressive, his teacher is great and really listens to my son – he is progressing so fast and having fun too. I never have to ask him to practice, he is always excited to go to his next lesson to show his teacher how good he is! Also, I did my homework and shopped-around, DeAngelis Studio doesn’t rope you into quarterly payments! I highly recommend, DeAngelis Studio! We’d love some new feedback to share with others! If you could take a few minutes to share your experience with DeAngelis Studio of Music, we would be very appreciative. If you have had a great experience at DeAngelis School of Music, please click the contact button below and share your stories and experiences regarding teachers, the studio, lessons etc. with us! We also welcome constructive feedback, and if there is something we need to do differently at the studio, we’d love to hear all ideas. All submissions will remain confidential. Did you have your own great experience with DeAngelis Studio of Music? Click here to share!